The Kecak also has roots in Sanghyang, a sacred ritual based on the idea that during the performance, hyangs, or spiritual entities will enter and possess the bodies of the dancers. The dance begins with the percussive chants of an all-male chorus. The men are clad in checkered cloths around their waists, sitting in concentric circles, forming a stage in the center. With burning flames as the only lighting, this cacophonous play creates a mystical atmosphere, illuminating the performers and audience alike in a haunting glow. The circular ensemble sways rhythmically back and forth and waves their hands as the drama unfolds. The Kecak Dance performance at Uluwatu Temple in Bali. As the plot progresses, the ring of acapella percussionists enhance the performance of the lead actors in the center by acting as the armies in the battle scenes, and even unite as an enormous, twisting serpent in the performance’s final climax. A triumph of style and emotion, the Kecak dance is sure to keep its viewers captivated for every second of the show. Unlike other Balinese dances, the Kecak is not performed to the accompaniment of Gamelan, which is the Balinese “orchestra.” Instead it is enacted to the sounds of dozens of male voices chanting “chak-achak-achak,” hence giving the dance its name. Another unique factor is that the Kecak was actually created for the sole purpose of entertaining foreigners. It is almost never watched by the Balinese. The Kecak Dance was originally a trance ritual accompanied by a male chorus. In the 1930’s, the German painter and musician Walter Spies took a deep interest in the ritual while he was living in Bali. He then worked together with Balinese dancer Wayan Limbak to recreate it into a drama, combining themes and movements from the traditional Sanghyang exorcism rituals with portions of the Hindu epic, Ramayana. The intention was to create a dance that was both authentic to Balinese traditions, yet appealing to a Western audience. The evil King, Rahwana, takes the shape of an old man and begs for water -- a plot to kidnap princess Sita. Wayan Limbak later toured the globe with a troupe of Balinese performers, thus popularizing the dance and making it famous throughout the world. Pura Luhur Uluwatu (Uluwatu Temple) is one of Bali’s 9 main temples, and is one of the places you can personally witness the Kecak Dance. The temple is perched at the edge of a steep cliff, overlooking the crashing waves 70 meters below. Originally a very small temple, Pura Luhur Uluwatu was first expanded by a Javanese sage during the 11th century. "Pura Luhur Uluwatu" - Uluwatu Temple in Bali. As the temple is sacred ground, one must be properly dressed before entering, as respect to the Balinese Hindus. Sarongs are available free at the entrance for women wearing clothing that does not cover their knees. Visitors to the temple can feel free to roam about and explore the temple grounds, but the central courtyard can only be entered during special rituals. 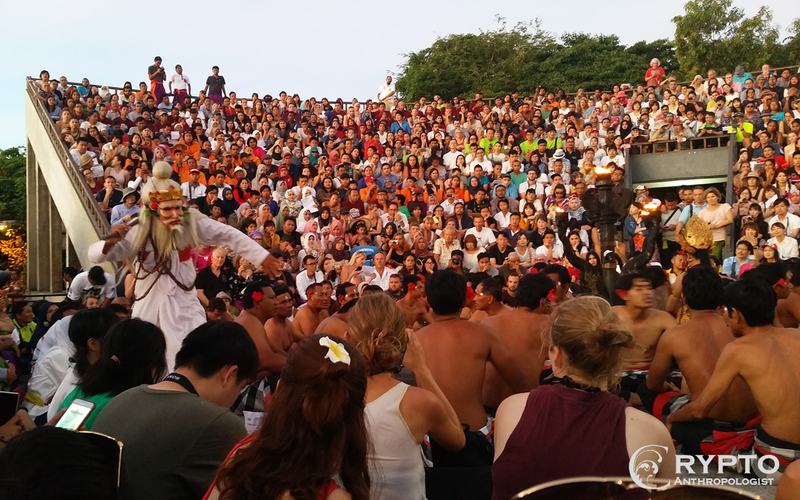 The Kecak dance is performed at the temple every evening at 6:00 p.m. in an open-air arena to the backdrop of the ember sky, as the glowing red sun sinks beneath the horizon. Tickets to the dance can be purchased for on the spot or online.